Model of Super Puma involved in incident recently cleared to fly after being banned over safety fears. A Super Puma was forced to stay overnight on a North Sea platform following concerns there was a problem with the helicopter. Offshore workers were stuck on the North Alwyn platform, 143 miles north east of Shetland, on Thursday night. 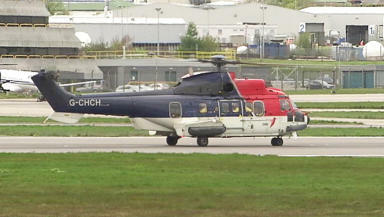 The helicopter, an EC225, which was only recently returned to service after being banned by the Civil Aviation Authority (CAA), had an indicator light come on as it was set to take around 15 people onshore. They were forced to remain on the platform overnight and wait for an engineer to come to clear it for flying. A spokeswoman for CHC Helicopters insisted it was not an emergency situation as no warning light had come on. The type of aircraft was banned from flying over water following two ditchings in May and October last year, but was later cleared to return to service after manufacturer Eurocopter made a series of safety improvements. The problem on Thursday night happened just after the CHC Super Puma had dropped off a number of oilmen and was preparing to return to Aberdeen heliport with 15 to 16 others. The Super Puma had landed at 6.45pm then refuelled in preparation to set off again. A spokeswoman for CHC helicopters said: “We can confirm there is an aircraft on the Alwyn platform overnight after an indicator light came on during a series of routine checks. It was not a warning light and this is not an emergency scenario. “There is an engineer going out this morning as, for logistical reasons, it was not possible to travel there last night. If it had happened earlier in the day, there would have been no need for the aircraft to remain overnight. The North Sea offshore workforce is still reeling from the aftermath of the recent Super Puma L2 crash off Shetland in which four people died. The Air Accident Investigation branch, in a preliminary report last week into the loss, on August 23 near Sumburgh, stated it was not caused by mechanical failure.